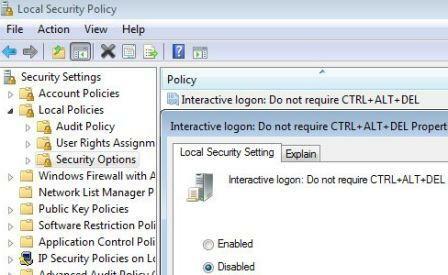 In Windows NT, Windows Server 2003 and Windows Server 2008, including its R2 variants, users have to press Ctrl + Alt + Del keys simultaneously and concurrently in order to gain access to logon screen securely. The mechanism is introduced as a security measure, which reduces the risk to attacks that attempt to intercept the users’ passwords. Requiring the action to press Ctrl +Alt +Del before users log on ensures that users are communicating by means of a trusted path when entering their passwords. Windows 7 and Windows Vista does not require user to press Ctrl + Alt + Del keyboard combination before booting up or reaching welcome screen or logon screen. For users who want to implement the security setting that requires user to press Ctrl + Alt + Del shortcut combination to logon, just follow the trick below. In the right pane, double click on DisableCAD registry key value, and set its value data to 0. Select and set the radio button of Disabled. Click on Start button, and type netplwiz into Start Search box, and hit Enter to open the User Accounts dialog box. Under “Secure logon” section, select and check the checkbox for Require users to press Ctrl+Alt+Delete option. Once enabled and turned on, Windows 7, Windows Vista and other version of Windows OS will prompt user to press CTRL+ALT+DEL in order to bring up the credential dialog box so that user can type in user name and password to login. Note: Local Security Policy Editor, like Local Group Policy Editor, is only available for premium editions of Windows 7 and Vista.